Given that I finished my website in a hurry, I skipped a few things initially. Over the past few weeks, I’ve been checking them off one by one. Most recently that has involved performance enhancements. 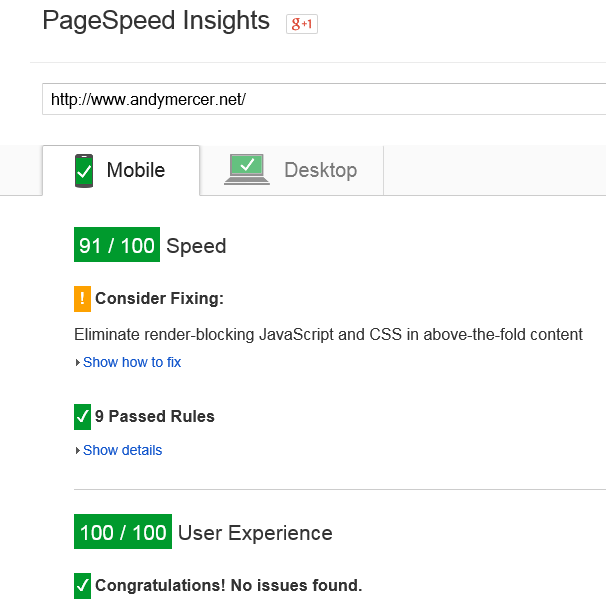 Reducing the number of CSS stylesheets to one, placing my scripts in the footer, adding browser and page caching, optimizing my images, and finally compressing and minifying everything has bumped up my Google PageSpeed Insights score up from 65 to 91. Still on the list is breaking up my stylesheet into two pieces so that I can inline the critical styles. There’s a Grunt task for this, but I’m worried about how it’ll handle media queries. Onwards to 100!